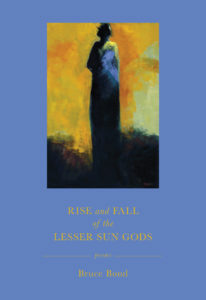 Delving into Rise and Fall of the Lesser Sun Gods by Bruce Bond really put me in a challenging moment. Luckily, it was a challenge worth facing. Throughout the book, as the title suggests, Bond focuses his poems on the rise and fall of life through a connection with nature. Reading it for the first time, I did little more than imbibe the magniloquent and rhythmic charm in each poem. My second round of reading, however, revealed the deep subject of gods, faith, death, and apprehension, which is magnetic due to the vibrant use of imagery. Besides the spellbinding writing, the intellectually invigorating topics that are discussed expose the gripping collection. Reading Rise and Fall of the Lesser Sun Gods is to face consistent questioning about the wars we face on a daily basis, and how we have escalations and cascades. In the book, there are so many instances where innocent people are harmed, yet there is no one to answer for such acts. The title alone cultivates the degree of importance in regards to gods, humans, and worldly interaction. Everything ends up causing a ripple effect. the incorrigible much of dread and wishes. These lines express the pain of being ripped out from a familiar place, such as a home or a country. As the poem continues, Bond evokes the imagery of flames, for instance, “to news that crackled open with the voice / of news on fire.” The use of these words is implying a certain idea, which brings us to the point of rising and falling. How so? Well, the poems show fluctuation while giving the plot of the scene. By the end of the poem, the lines play on the indication of hope rising back up. Bond writes, “Needs that follow suns and sun gods still / who fall, like us, and, in their falling, rise.” There is a process of cause and effect act that is in the works throughout the book. The structure of this poem clearly exhibits the low of the situation. part sun, another an elegy to sunlight. The imagery in these lines is as exquisite as the symbolism of the lamp itself. The lamp does display light; however, it is not authentic light; it is not the ultimate light. This non-sunlight is the death of what light actually is. There is an affirmative trait attached to having light, but lamp light does not hold as much value because of its unnatural process. The progression entails the rising and falling of the sun. The poem goes on to evoke images of “flames that fall to earth and just keep falling. / Light smolders through the flesh at dawn. / Another day, another obit for a stranger.” Bond demonstrates his ability to convey his main point of light and the struggles it undergoes. We see the image of light trying to push through the clouds in order to bring on another day. The word play in the poem creates a powerful scene. and night as the harvest of daylight. and there we were. Eating the daylight. The metaphorical aspect in these lines uncovers the way one lives and how time quickly passes by. It is a repetition of day and night, rise and fall, that moves time. The kid was caught in the crossfire, as is everyone who is alive. Bond writes of “Eating the daylight,” which is such a poignant and startling way to describe the ordinary passage of time. He keeps consistent with the image of the sun but also sneaks in the idea of growth within a person. The person was once a kid but as the sun keeps rising and falling, the kid becomes an adult (who eats the daylight), which makes it go that much faster. Bond extends further by introducing the idea of rise and fall within faith. One who has faith will be tested in situations that are trying, which is seen in the eleventh poem: “When a child goes missing, there is no god / to take her place. Snow melts. Eyes emerge.” Despite a person’s belief in god, one undergoes horrific experiences, such as a missing child, which makes them question their faith. Do they rise or fall? That rise or fall will occur based on how the individual is able to cope with the circumstances. These sad situations that Bond brings up are ones that are part of the worldly existence. Bond is beautifully conveying such states even though they are tragic. It is thus not only the word play that draws one into read Bond’s poems, but also the heaviness of truth behind the words. Aminah Abutayeb is an Adjunct Professor at William Paterson University. She recently graduated from Fairleigh Dickinson University where she obtained her MFA in Poetry. She is a poetry reader at The Literary Review. Her work has appeared in Philadelphia Stories and Common Ground Review.